Mayhem in El Monte 5 Results | MMA Fighting Events Videos Techniques UFC Fight Picks and News. Next up was a heavyweight fight featuring Eric Lynn Howell (Bloodbank) vs. Brock Combs (Chamkrew). These two engaged relatively quickly and Brock was able to score a nice judo style takedown. Brock controlled position for a while until Howell used his athleticism to reverse him. After a short scramble, Brock was able to get to Howell's back standing and took him down with a suplex. The round ended with not much more happening. Brock comes out with an overhand right into a double leg that pushes Howell up against the cage and eventually get Howell down. Howell was able to secure a tight guillotine as he went down but Brock made his way out of it and started a ground and pound attack. Howell was able to defend most of the chingasos. During the break the doctor examined Howell and the fight was stopped due to a medical stoppage. Brock Combs wins via doctor stoppage. Fight 3 featured a match up of undefeated fighters, Robert James Clavesilla (Pimpit) vs. Anthony Hernandez (Fight Academy). Clavesilla comes after Hernandez with and aggressive takedown attempt but Hernandez fights it off with an excellent sprawl. Clavesilla doesn't let up and eventually scores the takedown. Hernandez locks up Clavesilla in his guard tightly and the fight stalls. With nothing happening, the ref stands them up. With a few seconds left, Hernandez is able to catch Clavesilla with a hard chingaso coming the way of a right overhand right that got Clavesilla's attention. Clavesilla chases Hernandez with a takedown attempt but fails. They test the waters standing for a bit before Clavesilla gain goes for the takedown. Again, Hernandez defends strongly and is able to score with punches. Unrelenting, Clavesilla finally scores the takedown. In a repeat of the first round, the fight is stalled there and then the fight is stood up. Hernandez finishes the round unleashing a quick flurry of punches. There was no let up in Clavesilla's strategy. He goes after the takedown again and eventually gets it. This time he's able to work a little ground and pound but unfortunately for Clavesilla, Hernandez's ability to lock up the guard was too good. The ref stands the fight up. In a moment that pleased the chingasos hungry crowd and had them standing, Hernandez turns on about a ten second punches in bunches attack that had Clavesilla stunned. What was even more stunning though was that Clavesilla was able to survive the attack and the round. In a controversial decision that had a large part of the crowd booing, Robert Clavesilla wins via split decision. The action continued in fight number four with a lightweight matchup featuring Victor Cortez (Huntington Beach Ultimate Training Center) vs. Caleb Valotton (Reign). The fight starts off quickly with a back and forth fast and furious grappling exchange. It was an awesome showcase of the ground game with Valotton ultimately capitalizing on a mistake by Cortez and finishing him off with some kind of hybrid gator roll into an anaconda guillotine choke submission. Caleb Valotton wins via submission. Fight number five featured a matchup between Randy Romero (Team Destiny) vs. Grant Woods (Millennia). The fight starts with a nice exchange of stand up abilities. Woods is able to catch Romero with stiff jabs and Romero briefly hits the mat. Romero recovers quickly and continues to engage in a stand up battle. Woods is a little crisper and faster with the chingasos and appears to take the round. The fighters exchange good leg kicks to start off the round and then the stand up battle continues. Woods seems to measure the distance better catching Romero with chingasos, while Romero comes up short with most of his punches. Possibly knowing that he's down on the judges scorecards, Romero comes out like a wounded lion, aggressively coming at Woods. Romero unleashes a kicking and punching attack trying to turn the tide. Unfortunately for Romero, Woods had him timed and measured perfectly. Woods continued landing chingasos from all angles stifling Romero's attacks. The fight gets off to a fast start with a solid exchange of chingasos followed by some back and forth grappling as they fight for an advantageous position. Fernandez is able to score a nice takedown but Acosta finds his way up and both fighters stall in a clinch. After the fight is restarted, both fighters crash into a clinch again and fight for position until the round ends. The round gets off to a more conservative start with fighters patiently looking for an opening. The fighters start an exchange that ends with Acosta landing an illegal knee. The fight is stopped and a point is taken away. The fight is restarted and Fernandez lands a nice punch which sparks another back and forth battle. Fernandez shoots for a double leg takedown but Acosta defends well. The fight ends up against the cage and Acosta lands another illegal knee. The fight is stopped once again. Once the fight is restarted Fernandez is able to get off a couple of good punches and then shoots for another takedown. James defends and the round ends. Acosta comes out aggressively but Fernandez is able to fend him off. Fernandez attempts another takedown but the fight stalls against the fence. Fernandez doesn't let up on the takedown attempt and is able to complete the double leg by pulling Acosta up and away from the cage and slamming him down on the mat. The round ends with Fernandez on top, and Acosta trying to land chingasos from the bottom. Izic Fernandez wins via unanimous decision. Fight number seven was another feather weight matchup. This time it would be Richard Placencia (Team Destiny) vs. Anthony Paredes (Team Quest). Both fighters came out throwing chingasos in an attempt to dictate the fight. After exchanging chingasos standing, Paredes gets a takedown and ends up on top dropping knees from side control. Placencia is able to sustain the attack and the round ends. Paredes comes out attempting a high kick but falls to the mat. He quickly recovers and the fight ends up in a clinch. The fight turns into a clinch war with both going for takedowns. Paredes is able to score a double leg takedown and makes his way to the mount position. Paredes tries a ground and pound attack, but Placencia is able to avoid major damage as the round ends. After a brief stand up exchange, Paredes is able to score another double leg takedown. He is able to take the mount position and lands punches. Plancencia attempts to escape with no avail. Paredes finishes the round in the dominant mount position. Next up was fight number eight. 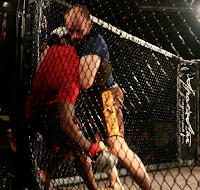 This one was a welterweight matchup between Grady Thomas (Bloodbank) vs. Adrian Gomez (Sub Fighter). Thomas comes out aggressively throwing a right over hand chingaso into a double leg. Gomez tries to defend the takedown by going for a guillotine but with no avail. The fight hits the ground and Thomas pops out of the guillotine. Gomez is able to make his was back up. This time, Thomas goes for a guillotine of his own and the fight goes back to the ground. Gomez fights off the guillotine and now he has top position. Thomas attempts a kneebar but comes up short. The fight stalls up against the cage and the round ends. Thomas comes out aggressively and is able to pin Gomez up against the fence. The fight stalls for a bit as the fighters fight for position. Thomas doesn't let up and scores the takedown. Gomez is able to recover and gets back up. Thomas is able to muscle Gomez back up against the cage and pins him there until the round ends. The fighters exchange some stand up. They both wind up for a power punch and throw it at the same time which culminates in a clinch. Thomas is again able to over power Gomez and pins him against the cage. The fight stalls there and the ref restarts the fight. After the restart the fighters quickly engage and go right back into a clinch. This time Thomas scores a nice takedown and takes the back of Gomez. There's no time for Thomas to take advantage of the position as the round ends. After a feeling out process Pirozhokov shoots for a double leg. Law defends the the takedown attempt but Pirozhokov ultimately gets the fight to the mat. Pirozhokov dominates the ground game from there going for a guillotine and then taking the back and attempting a rear naked choke as the round ends. In a repeat of round 1, there's a short feeling out process and then Pirozhokov scores a takedown. Pirozhokov again dominates the ground game finishing the round with some ground and pound from within Law's guard. Pirozhokov doesn't stop with his strategy of getting the fight to the ground quickly. He scores another double leg takedown and again dominated the round on the ground. Law has no answer and Pirozkov finishes off the round by taking Law's back. In Fight number 10, the ladies stepped inside the cage at Mayhem in El Monte 5. It was a matchup between Erika Newsome (FightWorx) vs. Ashlee Evans Smith (Undisputed). This fight stared off with a chinasosfest! The ladies were throwing punches and kicks with no one retreating. The only breaks in the chingasosfest would be tough clinches were the chingasos would continue to flow. The fight went back and forth until the round ended. Very exciting round! The fight continued with both fighters throwing chingasos aggressively. It was a trail mix of kicks and punches that I'm sure made their coaches proud. Smith was able to grab a hold of Newsome and pin her agains the cage. Newsome was able to release and back to punching each other in the face it went. No change in the aggression in this round. The chingasosfest continued until Smith was able to pin Newsome agains the cage. Newsome was able to get a tight hold of Smith's neck. Newsome battled Smith down to the mat while keeping a hold on her neck and was able to finish off a guillotine submission. In what was probably the fight of the night, Erica Newsome wins via guillotine submission. Fight number eleven was the main event. Going to MMA battle was Sergio Machado (Team 3 Fight Academy) vs. Eric Steans (PKG). There was a short feeling out process. Machado testing the waters with kicks, and Steans with punches. The fighters then clinch and Machado is able to score a takedown. Machado was looking good on the ground and then goes for an armbar. Steans is too good to fall for it, escapes, and winds up on top. Machado continues with his submission attack by going for a kneebar but again Steans escapes and lands a solid punch. Machado is able to get the takedown and passes to halfguard. Steans defense well and then reverses position. Steans stands but Machado is able to grab a leg and attempt a kneebar. While Machado works for the kneebar, Steans is able to rain down vicious punches. Machado releases the kneebar and is able to catch Steans in a triangle submission attempt. Unfortunately for Machado, there's not much time left and the round ends. 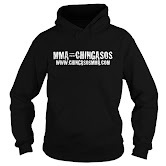 The round starts with the fighters trading chingasos and then Machado pulls half guard. Machado has trouble working his submission game as Steans fights him off with punches. Eventually Machado is able to grab a hold of a kimura. The fight becomes a battle of Machado trying to finish the kimura and Steans defending. Steans is finally able to pull his arm out and escape. Machado is relentless with his submission attack and attempts another kneebar but the round ends before he can try to finish. In a great battle of submission attempts versus vicious ground and pound, Eric Steans pulls off the unanimous decision.